Reason for Stay: 2 fractures to her Humorous and shoulder pain. How did this patient hear about St. James: Her nieces live in the area and know about the facility. Ms. Lena Dimaio arrived at St. James on May 30th, from a hospital in Brooklyn. Ms. Dimaio fell at home and fractured her humorous in two places. She also experienced great shoulder pain. From Brooklyn, her nieces, Cathy and Josephine, took Ms. Dimaio to St. Charles hospital, where she stayed for one week. Ms. Dimaio was not able to put any weight on her left side; she couldn’t use her shoulder and arm. She was the perfect candidate for rehabilitation, she needed her arm to heal so she would be able to use it again. Ms. Dimaio was in a lot of pain when she arrived at St. James. After being at St. Charles for one week, Ms. Dimaio had to choose a facility to begin her rehabilitation process. Her nieces live out here in Suffolk County, and knew of a bunch of rehabilitation communities. After looking around, they chose St. James. The nieces were given a tour of St. James and fell in love with our community. Ms. Dimaio’s room was ready for her when she arrived at our community. It was shortly after she arrived where she was greeted by the entire interdisciplinary team. Within the first 24 hours, she was seen by the nursing team, therapists, recreation, administration, concierge, and many other staff members. We were all here for her to ask her any questions she or her family had. Her two therapists, Cindy and Nicole, worked closely with her and were the ones who evaluated her upon admission. Ms. Dimaio arrived at St. James, unable to put any weight on her left arm, but was able to use her left side to move about the facility. Within the first couple of weeks, Ms. Dimaio was taken to St. Charles orthopedics for x-rays of her left arm. Due to immense pain, she was in an arm spring and could not put any weight on her left arm. After the spring was taken off, her arm was put in a sling, but she still couldn’t put weight on that arm. Ms. Dimaios’ sling was removed on June 25th and a metal cast was put on her arm. She had this cast on for about three weeks throughout July. She was still unable to put any weight on the arm but was able to use it. Over the next few weeks which included her therapy sessions, her arm became stronger and was able to use it in manners such as: grabbing her phone and using it, wheel herself in the wheelchair, grab her food tray, etc. The main goal that was set in therapy was for her to raise her arm and to be able to touch the top of her head and reach behind her. She exceeded in this and proved that this was all possible. Cindy and Nicole worked closely with her and they formed a wonderful relationship. She enjoyed going to bingo, music, arts and crafts, and sometimes would order in and have dinner here with some of her friends. She enjoyed her time here and was able to get the rehabilitation she needed. The whole interdisciplinary team made that all possible. On May 30th, Ms. Dimaio was discharged to her home in Brooklyn. 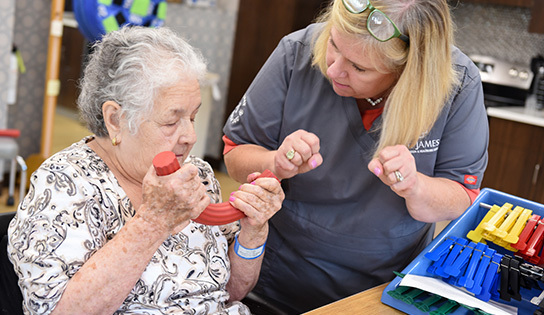 By the end of her rehabilitation journey, Ms. Dimaio was able to bring her arm to her head with no help. She was still in some pain but was able to do it. She was ecstatic about the progress that she made and also about going home. She will be having an aide at her house for clinical support. We at St. James are so proud of Ms. Dimaio for all of her accomplishments she made here and wish nothing but the best for her in rest of 2018!